Melbourne Town Hall is one of those places that should be on everyone's list to visit but I've yet to meet a Melburnian who's been there. It's a pretty impressive building. I had a look round here on one of the Melbourne Open House days a couple of years ago. .........And get a free tour into the bargain! .........but I do remember the wood panelled Council Chamber is particularly impressive. .........and there are paintings and photos of big occasions and well known or high appointed people to look at. I even got to stand out on the Portico where the Beatles waved to an adoring crowd back in 1964! You can too!! 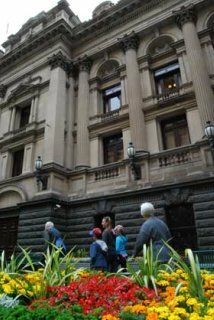 The tour gives you the chance to learn about the social and political significance of this grand 19th century building, as well as looking at its impressive architecture. .........Numbers are limited though so booking is essential and required one day in advance. Tel (03) 9658 9658. 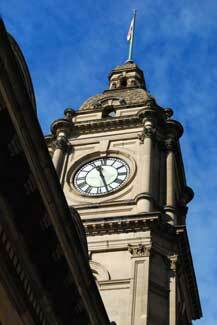 The Town Hall is located on the corners of Swanston Street and Collins Street, Melbourne. Check out the map below. Click the blue writing beneath the map for a better view. While you're here, don't miss the small City Gallery at the front of the building to the left hand side of the main entrance steps. It's rather hidden but is often worth a look. It's located in the ticket office building.